More than 40 current and former Missouri State lovers attended the conference. 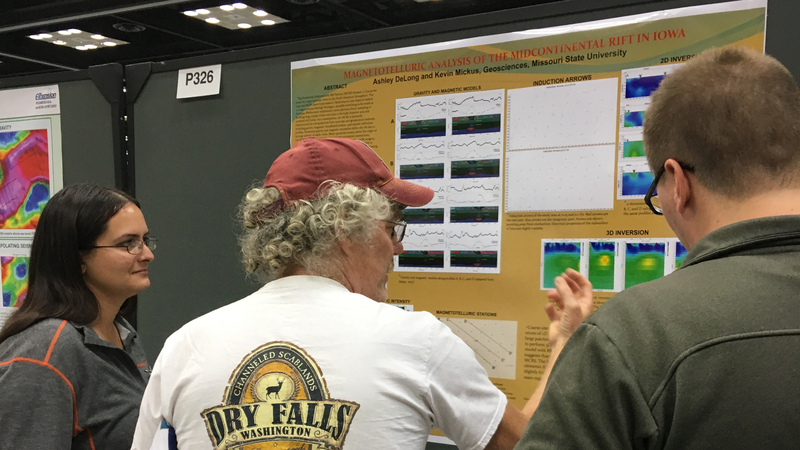 Indianapolis, Indiana, was full of aspiring and current geologists at the Geological Society of America (GSA) conference Nov. 4-7. Almost 6,000 students, faculty and researchers attended. Of that 6,000, there were several familiar faces. More than 25 people from Missouri State University presented at GSA. More than 15 students presented their work. An additional 15 alumni were also present. Joe Gillman, a GGP alumnus and State Geologist and Missouri Geological Survey Director, won the prestigious GSA Fellow. Dr. Kevin Mickus was the conference’s technical chair. A couple MSU presentations stood out. Graduate student Ashley DeLong presented her modeling results of the crustal structure beneath the Iowan Rift. 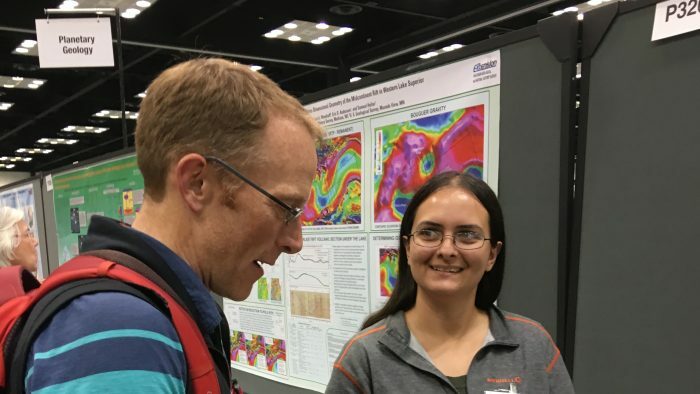 She used a 3-dimensional model to find differences in the deep crust and upper mantle. Her model is about 250 kilometers deep. Undergraduate student Bailey Pfitzner used a drone so she could accurately represent topography according to its angle during motion. GGP also hosted a night for MSU alumni that attended the conference. This was open to students as well to provide connections to alumni. Other highlights of the conference include current geological changes. This year is the 50th anniversary of the discovery of plate tectonics. That session lasted a day and a half due to many exceptional experts presenting. Kilauea, a volcano, has also been very active this year. Directors of the Hawaiian Volcano Observatory USGS presented about the monitoring they are doing and answered questions. Students and faculty alike enjoyed attending these special sessions.